East Greenbush Community Library card holders in good standing may request through interlibrary loan items not owned by a library in the Upper Hudson Library System (UHLS). Most requests are filled in 2-4 weeks. Patrons are responsible for any fee imposed by the lending library upon approval of the patron. If a renewal is needed, contact the library to determine if the loan period may be extended. 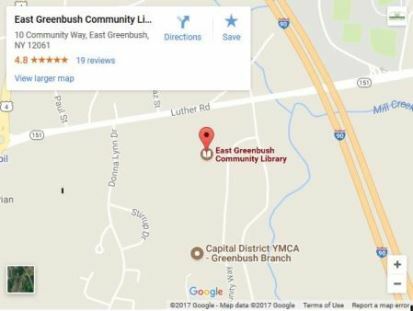 Renewals depend on the policy of the lending library, not the policy of the East Greenbush Community Library. Borrowers are responsible for the replacement cost of lost or damaged materials as imposed by the lending library. Copies of journal, magazine, or newspaper articles less than 100 pages. In general, lending institutions charge for articles over 30 pages. Items owned by a UHLS library. To see if a UHLS library owns an item, search our catalog. Renewals are dependent on approval of lending institution.